Three ecosystems in one workshop: prairie, water and woods. Investigate the dynamics of nature including energy cycles, resilience and biodiversity to reveal interdependent relationships among organisms within prairie, water and woodland ecosystems. 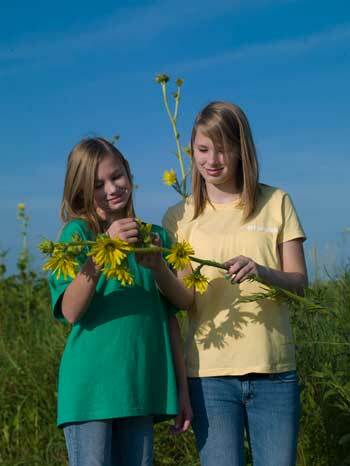 Learn biological principles and how to use standard ecological measurement techniques to teach students to investigate, assess and compare these different habitats. If you have already attended a Particles and Prairies workshop, you can still attend and get credit for this new workshop. "I am overwhelmed by the info, the activities, the wealth of resources — both written and supplies. This is the over-all best class I've ever had." "It offered a lot of great instructional materials; allowed me to expand my understanding and experience material I would be presenting to my class." In this ecology unit, students develop a deep understanding and appreciation of the components of prairie, water and woodland ecosystems. Using the same techniques that scientists use, students learn to collaborate and collect, upload, analyze and interpret data. At school, students can query data from the quadrat studies to explore trends in the restoration of the prairie over time. "The P&P curriculum is hands-on, rigorous and engaging. The activities and labs provide opportunities to participate in scientific practices and promote the ideas found in the cross cutting concepts of the Next Generation Science Standards." After attending the workshop, teachers may bring students to Fermilab for free field trips as often as one desires. Students make observations and gather data that provide vital information to help Fermilab's ongoing prairie restoration project. They obtain and communicate information about the similarities and differences of prairie, water and woodland ecosystems. If you have already taken a Particles and Prairies workshop, you qualify for Energy and Ecosystems field trips. Use the Field Trip Request Form. "I can't even imagine what could have been done better. The students were engaged from beginning to the end while learning. Even my students, who are not particularly outdoorsy or, to be frank, interested in science came away with something. Thank you for one of the best field trip experiences we have ever had." "Fermi's docents continue to impress me with their knowledge, their patience, and their outstanding ability to work so well with a difficult age group! I've taken groups to other prairie trips in the area, but this one is always far superior!"